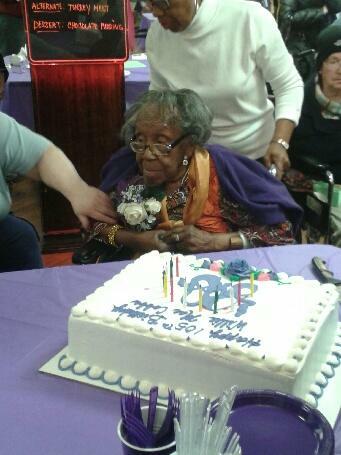 This week, Jersey City resident Willie Mae Cobbs celebrated a major milestone, her 105th birthday! Family, friends, fellow residents and staff threw her a birthday party at Alaris Health at HarborView where she resides. Ms. Cobbs has lived at HarborView for the past few years as a long-term care resident. 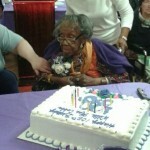 Even at age 105, Ms. Cobbs remains passionate about dancing, her weekly bingo games and attending church services. Ms. Cobbs first moved to New Jersey from her home town of Bowman, South Carolina to work as a laundry care professional. She has four sons and one grandson. She says her key to aging well is to always take care of yourself. Pingback: Alaris Health at HarborView celebrates Willie Mae Cobbs turning 105 years young!